Take jar, fill with ingredients, add pickling liquor, seal, store – it’s amazing how such a simple process can create such intense, beautiful flavours. Pickling is a method with thousands of years of history behind it – born out of necessity rather than culinary intrigue – and is currently enjoying a huge renaissance of interest the world over. Whether you’ve a glut of vegetables you don’t want to waste or are looking to add a piquant touch to a dinner party dish, a jar of pickles is invaluable to any cook. This collection of pickling recipes has something for everyone. Chloë King’s Pickled mushrooms and Pickled fennel are perfect for the beginner, as are Marcus Wareing’s beautiful Vanilla pickled vegetables, which offer the perfect example of how flavours can be infused into ingredients through preservation. Tired of buying jar after jar of gherkins in the shops? 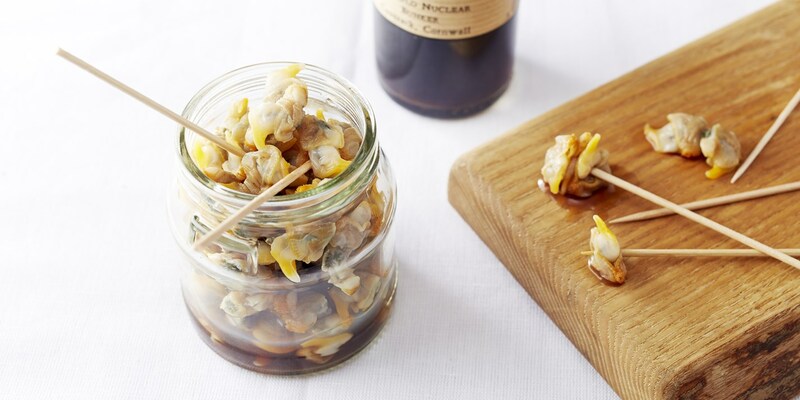 William Drabble’s Sweet and sour pickled cucumber is a doddle to make and much nicer than any store-bought alternatives. And for recipes which use pickles to lift other elements on the plate, take a look at Pascal Aussignac’s stunning Scallops with pickled blueberries and lavender and Robin Gill’s Beef tartare with sour onions and oyster emulsion. Pickling at home is easy, but make sure you know how to sterilise jars correctly beforehand. Check out our guides to pickling things like gooseberries, red cabbage and even mackerel, too, if you’re after a little inspiration.